Howdy! Dentures are a huge part of some elderly patients so it is pretty important that they get the grasp to take good care of them early. It may sound a bit daunting at first but with these tips you will be able to take care of your denture and have them for many years. Dentures are like natural teeth. They need to be brushed at least twice a day. Just like regular teeth, dentures can get stained and develop plaque and bacteria. The best way to wash denture is to rinse them in water or cleaning liquid to remove food debris first. Then, you want to brush them as gentle and carefully as possible. I recommend a soft bristled toothbrush. 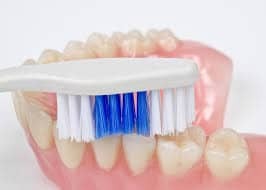 Avoid using toothpaste because it is too abrasive for dentures and use mild soap instead. Dentists in Los Algodones also suggest that you should also avoid using bleaching agents. They can damage pretty bad, bleach the pink part and imitates gums. In case you use denture adhesive, clean the grooves that fit against your gums to remove any adhesive left. Brush your gums, insides of the mouth, cheeks, and tongue to avoid affections like gingivitis that can ruin your mouth and dentures. That way you will be ahead of bad breath too. Soak your dentures daily in a nonabrasive denture cleaner to remove food that can cause plaque and bacteria. You can do this after brushing or before going to bed at night. Make sure you follow the instructions from the manufacturer and never ever use denture cleansers inside your mouth. Don’t forget to rinse your dentures well before putting them back into your mouth. Remember there are many different types of denture cleaners available in the market like effervescent, gels, and creams. You can find them very cheap at Los Algodones pharmacies! Take off your dentures for 6 to 8 hours a day to help your mouth to heal from soreness and irritation that might happen during the day for extended use of dentures. A good idea is to take them off before going to sleep every night. Store your dentures in warm water or a special solution approved by your dentist. This is an important step to keep their original shape and also prevents them from drying. Avoid using hot water because they could end up bending and deformed. 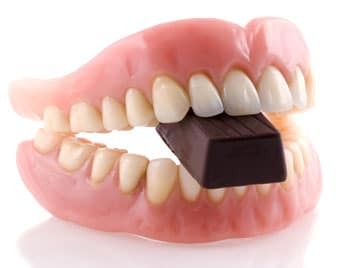 Avoid eating sticky food, as they can easily get trapped in your dentures. This is not only re ally uncomfortable, but also can cause tooth decay and discoloration. Chewy type foods like caramel and hard foods like nuts are bad because they can lose or break badly your dentures. Instead, try to go for softer snacks like air-puffed vegetable crisps, cereals or a nice smoothie. These are so much better for you as they are healthier snacks that are easier on your dentures. Staying well hydrated helps your body to replenish fluids like saliva. Saliva is a good ally to fight bacteria that naturally forms inside the mouth. This can help to balance things in your mouth to avoid ruining your dentures. Drinking at least eight ounces of water daily is a good quantity to replenish your body fluids. Paying a visit to your dentist for regular checkups is a key habit that ensures the longevity and quality of your dentures. Your dentist can also detect gum irritations, sore or infections, such as gingivitis. Don’t be shy to ask any question about advice on how to maintain properly your dentures or any other issues that you may be experiencing, like discomfort and such. They will be more than happy to help you, especially here at Dental Solutions in Los Algodones, Mexico.